We highlight a potentially lethal complication of acute severe pancreatitis that may not be suspected in severely ill patients. A 41-year-old woman developed acute severe pancreatitis following endoscopic retrograde cholangiopancreatography (ERCP) for suspected choledocholithiasis. 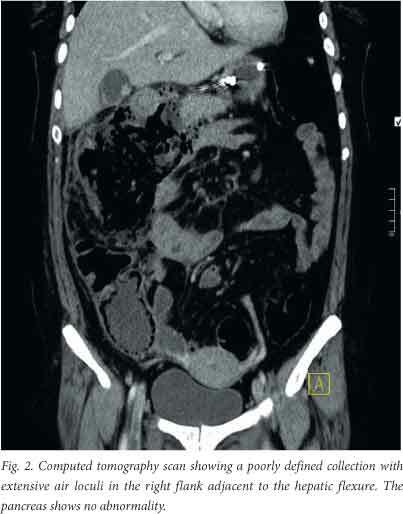 When her condition deteriorated dramatically after 2 weeks of intensive medical management, a computed tomography scan and water-soluble contrast enema examination revealed a large colonic perforation and associated collection in the right flank. Surgical management included an extended right hemicolectomy and a second laparotomy to attend to soiling at the surgical site. She survived and was discharged. Colonic perforation is a recognised complication of pancreatitis that carries a high mortality. It may result from a combination of ischaemia to the colon and a direct effect of noxious pancreatic enzymes. Almost all cases are only diagnosed at laparotomy. In view of the current trend of non-surgical management of pancreatitis and associated complications, colonic perforation should be considered in patients who deteriorate or fail to improve. To our knowledge this is the first case of a secure pre-operative diagnosis of colonic perforation due to to pancreatitis. Colonic perforation is a rare complication of acute pancreatitis. Few cases and small case series have been reported in the literature. We describe such a case, briefly review the literature, and highlight the difficulty in establishing an early diagnosis. A 41-year-old woman with HIV infection who had not had anti-retroviral drugs presented with jaundice secondary to choledo-cholithiasis. Multiple common bile duct stones were extracted at endoscopic retrograde cholangiopancreatography (ERCP). She failed to keep appointments for laparoscopic cholecystectomy. She presented a year later with right upper quadrant pain and mildly abnormal liver function test results. Her bilirubin level was normal, and a transabdominal ultrasound scan showed no dilated bile ducts with stones in the gallbladder. ERCP was performed. Cannulation of the papilla was difficult, but a balloon-occluded cholangiogram was normal. She developed severe upper abdominal pain after the procedure. Findings on clinical examination were normal. Pertinent laboratory values were as follows: serum amylase 451 U/l, serum lipase 595 U/l, C-reactive protein (CRP) 189 mg/l, haemoglobin 13.9 g/dl, white blood cells 16.8x109 cells/l, alanine aminotransferase 37 U/l, alkaline phosphatase 131 U/l, and total bilirubin 17 μmol/l. 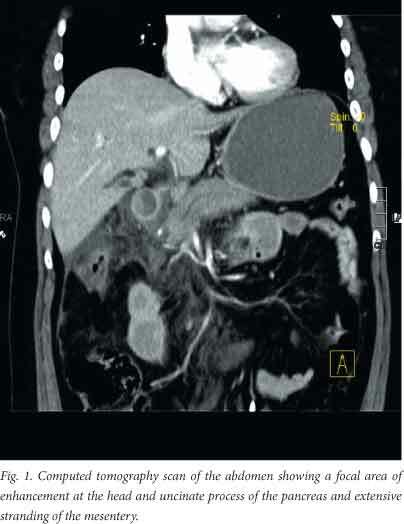 A computed tomography (CT) scan of the abdomen was suggestive of acute pancreatitis (Fig. 1). A diagnosis of post-ERCP pancreatitis was made. Supportive medical treatment consisting of aggressive hydration and pain management was commenced. The patient was also started on - intravenous antibiotics for possible duodenal perforation. On day 4 she began to vomit. Examination revealed tenderness and a distinct fullness in the right upper quadrant and epigastrium. Two abdominal ultrasound examinations showed cholecystitis but no collections in or around the pancreas. By day 10 she was still vomiting with tenderness in the right upper quadrant, but her inflammatory markers were on a downward trend. On day 12 she was better and being prepared for discharge. However, by day 16 her condition had deteriorated. She had dizziness, generalised weakness, vomiting and syncope. Her inflammatory markers dramatically increased with a CRP level of 309 mg/l and an elevated white cell count. Her renal function deteriorated over the next 3 days, with a serum urea level of 36 mmol/l and a creatinine level of 319 μmol/l. A CT scan was planned but was delayed because of the abnormal renal function. On day 26 she developed fever. Her renal function had improved with fluid management, allowing a contrast-enhanced CT scan to be performed. This scan suggested colonic perforation (Fig. 2). A water-soluble contrast enema examination was done to investigate the collection further. It showed a contained colonic perforation involving the proximal transverse colon and hepatic flexure (Fig. 3). At laparotomy an inflammatory mass was found at the proximal transverse colon with extrusion of stool. An extended right hemicolectomy was performed and an end-ileostomy fashioned. A subtotal cholecystectomy was also perfomed. The patient suffered a peri-operative myocardial infarction and had sepsis postoperatively. She was admitted to the intensive care unit (ICU) for appropriate care. A second laparotomy was perfomed on her second day in the ICU because of extensive soiling at the surgical incision site. Her condition gradually improved with supportive management. She was transferred to a high-care ward and then discharged for nursing care at her local regional hospital 7 days after leaving the ICU. The fluctuating course characteristic of our patient's hospitalisation is well described in acute pancreatitis. Her clinical deterioration and the elevation in inflammatory markers after 2 weeks of steady improvement were in keeping with the development of infected pancreatic necrosis and/or an infected pseudocyst. While we were considering endoscopic ultrasound-guided therapy for a suspected infected fluid collection, the CT scan became available. This scan and a subsequent water-soluble contrast enema examination confirmed a communication between the collection and the right colon. No pancreatic necrosis or pseudocyst was identified. In recent years, surgical intervention in acute severe pancreatitis has followed a conservative approach. Intensive medical support in addition to timeous endoscopic and/or radiologically guided drainage procedures are becoming the preferred management strategy. 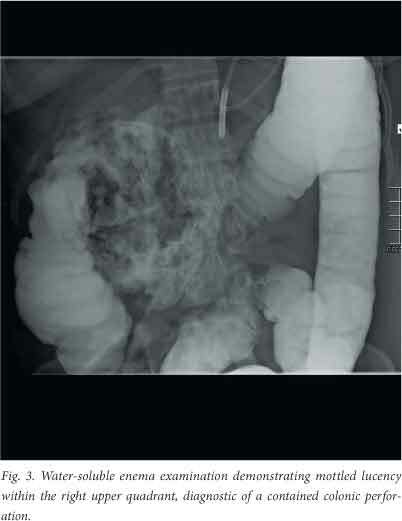 In a retrospective case series, colonic perforation or necrosis was identified in 9/22 patients who had severe pancreatitis, failed to improve on medical therapy and were deemed to require surgical exploration. Interestingly, colonic involvement was not suspected pre-operatively. Pathological examination of the resected specimens revealed a spectrum ranging from pericolitis to ischaemic necrosis. This was from a period when early surgical intervention was standard practice. Six of the nine patients described died from sepsis despite colonic resection. In a systematic review of colonic complications of pancreatitis, Mohamed et al. analysed 43 articles with pooled data on 97 patients from 1950 to 2006. All cases were diagnosed at operation. The median presentation was at 25 days into the episode of severe pancreatitis and the mortality rate was 54%. The main presentations were identified as colonic necrosis, fistula and strictures. Not surprisingly, the authors concluded that pre-operative diagnosis is difficult and a that a high index of suspicion is required. It has been suggested that the pathophysiology of colonic involvement from severe pancreatitis is caused by relative mesen-teric ischaemia with possible thrombosis or by retro-peritoneal tracking of enzyme-rich pancreatic fluid onto the colon. Van Minnen et al. reviewed the histological findings of 14 patients with colonic involvement in acute pancreatitis. All showed fat necrosis and pericolitis. In 8 patients the mucosa, submucosa and smooth-muscle layers were intact. This suggests a greater role for pancreatic enzymes leading to colonic involvement in acute pancreatitis. There is evidence to suggest that low-molecular-weight heparin may be of benefit in acute pancreatitis. This is directed at addressing the microcirculatory dysfunction associated with severe acute pancreatitis, but given the possible contribution of ischaemia to colonic involvement and the high mortality from this complication, one could argue that this simple prophylactic treatment may have additional value. To our knowledge this is the first case of a secure pre-operative diagnosis of colonic involvement from acute pancreatitis. Although rare, this complication should be kept in mind in patients who do not improve with intensive medical care or, as in the case described, deteriorate appreciably after steady improvement. The case also emphasises the need to appreciate the serious complications that can arise from a 'routine' endoscopic procedure (ERCP). Despite limited resources with regard to non-invasive biliary imaging modalities, avoiding unnecessary ERCPs is possibly the best strategy to avoid such complications. Multidisciplinary involvement and communication between gastroenterologists, surgeons, radiologists and critical care specialists is essential in the management of patients with severe acute pancreatitis who continue to deteriorate or relapse.